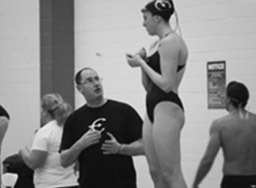 Ilan Noach brings nearly 30 years of competitive coaching experience to Empire Swimming. Prior to starting Empire, he was head coach of Middies Swimming for twenty-three years. Ilan is responsible for building the Middies Swimming organization, having taken over a team of roughly 75 swimmers and building it to over 200 swimmers consisting of novice swimmers to Olympic Trial Qualifiers. During the past twenty three years, Ilan has coached swimmers to numerous successes at all age-group levels; County Champions, Metropolitan Junior Olympic Champions, Eastern Zone Champions, YWCA National Champions, New York State High School Champions, High School All-Americans, Empire State Game Gold Medalists, NAG Top 16 individual and NAG Top 10 Rankings (including several #1 rankings), Region I Finalists and Champions, Junior National Finalists and Champions, Senior National Qualifiers, Olympic Festival Participants and Olympic Trial Qualifiers. In 2004, Ilan coached his first Olympic Games Qualifier. He attended the Olympics in Athens as a member of the Philippines coaching staff. Under Ilan’s leadership the Middies won 22 consecutive YWCA National Titles!